Actor, Director, Puppeteer, Writer, and the person you call when you make reservations at 440-779-1284. Dover Players started as Dover Playhouse in 1983 which was run by Jack and Jackie Boss as a theater which would produce musicals on the North Olmsted Middle School stage. Beverle Martindale was originally approached to be on the board, but since she had never directed a musical, she felt unqualified and declined. After the musical "Anyone Can Whistle" lost money, Beverle was again approached for ideas of plays which could make money. She joined the board and had Dover expand its scope to include plays which had no royalties and were cheap to produce which would make enough money to replace what the musicals lost. For the most part this meant Shakespeare. Dover could only use the Middle School stage in the summer, so it was decided to put on three plays each summer: a Shakespearean play, a musical and a modern play. Over the years Dover put on "Taming of the Shrew," "As You Like It," "Macbeth," and "Julius Caesar," while each year a musical would be produced such as "1776" or "Gigi" and modern plays were included "Dracula" and "Frankenstein," "Blithe Spirit" and "Odd Couple." Due to this arrangement, Dover managed to break even every year. In 1988 Dover was allowed to use the Old Town Hall for its plays, putting on "Twelfth Night," "She Stoops to Conquer" and "Comedy of Errors." Beverle left the board and Dover stopped doing musicals and stopped using the Middle School in 1990 and did "Murder at the Vicarage." The next year the Old Town Hall was needed to store bus parts so Jack and Jackie Boss thought the theater was through, but Beverle came back to the theater as its president with a new idea: put on plays under an army tent. We changed our name to Dover Players since we didn't have a playhouse anymore and looked for a place to park our tent. The North Olmsted Recreation Center parking lot became the site and the plays would be FREE, depending solely on donations from patrons. As before, it was decided that each year one modern play and one Shakespeare play would be put on there each summer. Dover's first show, "M.A.S.H." was a smash! People loved that the army tent was part of the show and that they could pay whatever they wanted. The play proved so popular that we couldn't accomodate the rush, and first come, first serve, was adjusted to include reserve seats for those who paid $5 per person. Future modern plays also made the tent part of the play like "Murder on the Nile" where it became a boat or "Hogan's Heroes" where it became a prison. Todd Evangelista, who had been an actor for Dover since 1987, was tapped to direct the Shakespeare plays and using a huge cast of amateurs mostly from North Olmsted High School put on "Taming of the Shrew," "A Mid-Summer Night's Dream," "Much Ado About Nothing," "Tempest," and many more. 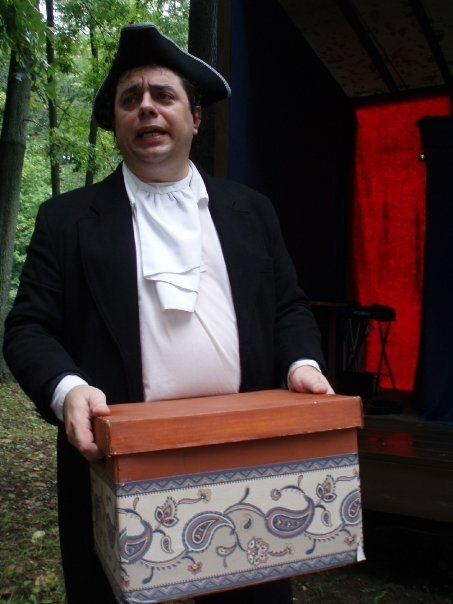 Unfortunately, theft became a problem at the tent, so we did shows in Olmsted Falls for a couple years, doing only one show each year, but we still managed to do some Shakespeare with "The Complete Plays of Shakespeare, Abridged." Then we were invited back to the Old Town Hall again and Jim Volkert did Neil Simon's "Fools." Dover started doing more plays there such as "Blithe Spirit," "Two Pails of Water" and "R.U.R." Dover still showcased new works by new authors such as "Jake's Dilemma," "A Question of Guilt," "A Villain Comes to the Dark Horse Inn" and "Mice Told Tales" and the musicals "Shape" and "A Fresh Start at Sunrise Laundromat." Todd Evangelista did a series of five Sherlock Holmes plays and many mysteries like "Spider's Web" and "Ordeal By Innocence." Some very ambitious projects were done in the Old Town Hall as well, like "The Lottery," "Stories from the Witch House" and "Doll's House." Each year Dover's goal is to do three plays in Spring, Summer and Fall. Each year Dover discovers new actors, writers and directors. But we couldn't do anything without our patrons. The show may be free since 1993, but each play they donate money to our theater. Some throw in change or singles, some throw in fives or tens and some throw in twenties, but without their generosity none of this would be possible. Actor, Director, Puppeteer, Writer, President of Dover Players and the person who is Dover Players.